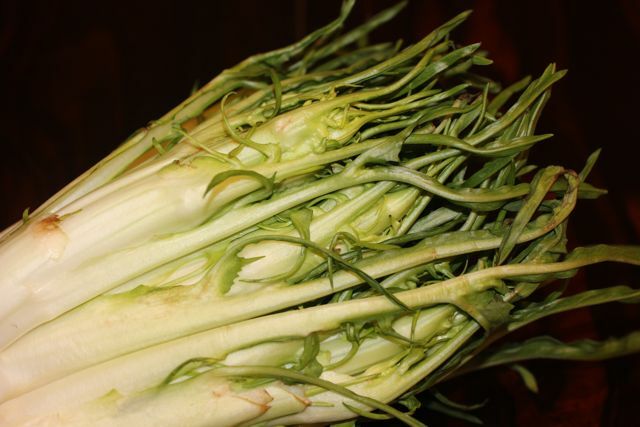 Puntarelle looks, for lack of a more intelligent description, like several thin phallic endives clumped together and partially hidden by frilly dandelion like leaves. Hahaha, I am sure there are much better published descriptions of this vegetable. It is pale in color, and clearly related to the chicory family. It possesses a slightly bitter flavor, but not so overwhelming as to be unpalatable. 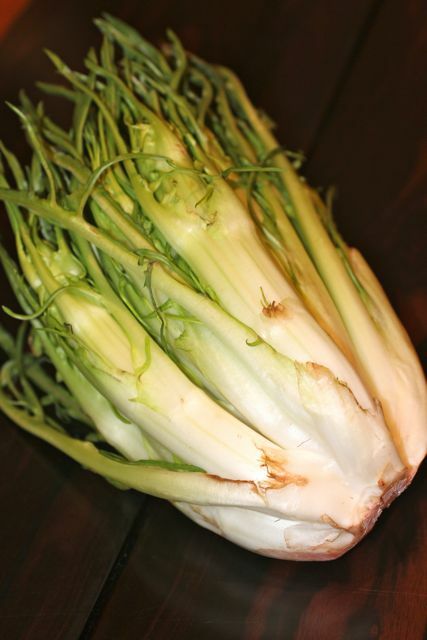 Here’s more on the vegetable, also known as Catalogna de Galatina. The prep work is a bit more involved than most salad greens. You have to remove any bruised or browning leaves, then slice each section into thin vertical strips. 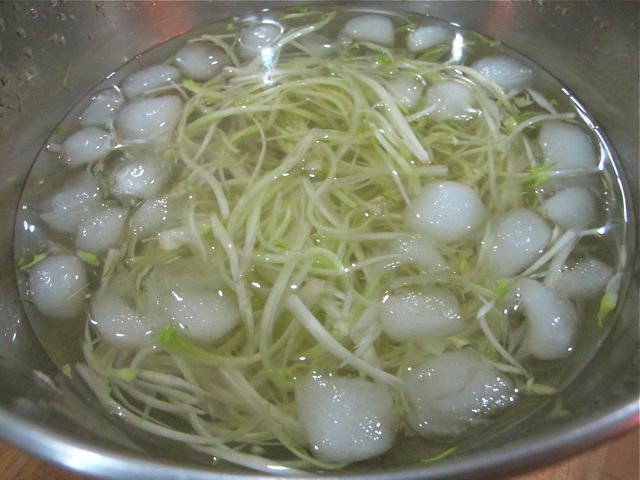 Immerse the strips in iced water for about an hour, and the strips will curl and crisp up, a process similar to that of celery sticks in ice water for decorative frills, etc. 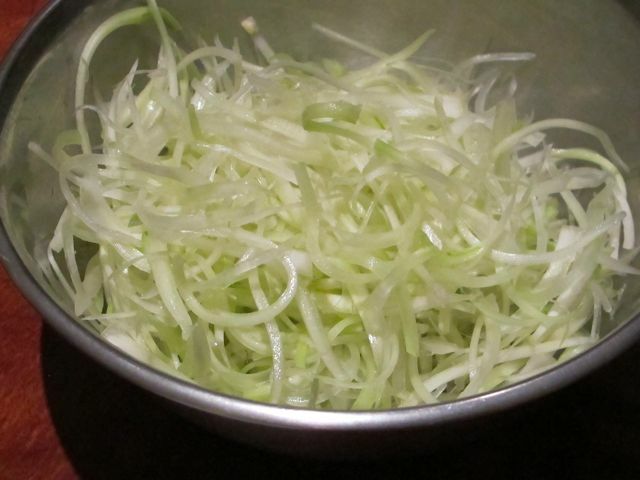 Drain the puntarelle and put it in a salad spinner to remove the water. Toss this with some sliced treviso radicchio that has been sliced. Prepare a simple dressing of a few anchovy fillets, good olive oil, some mustard, salt and pepper, fresh lemon juice and a splash of red wine vinegar. Whisk this all together and adjust seasoning to taste. Drizzle the salad dressing over the greens and toss lightly. Serve will some grilled meat or seafood. It was really DELICIOUS! Not bitter at all, and the refreshing light crunch of the puntarelle combined with the slightly bitter radicchio made for a very nice counterpoint to grilled chicken. If you wanted to make a tricolore salad, you could have added in some young wild arugula. 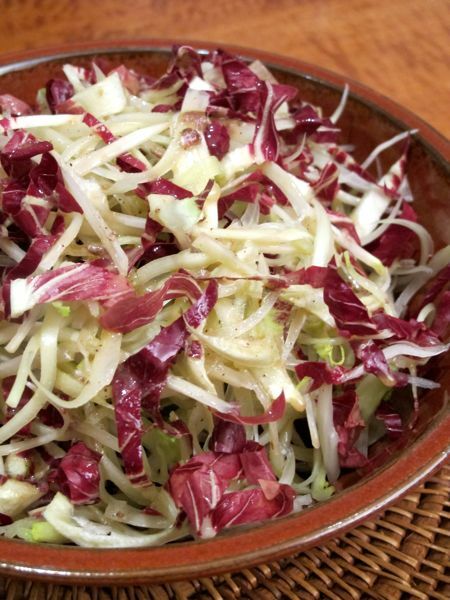 Gosh, I wish puntarelle were available here on a more regular basis! Thanks, M! 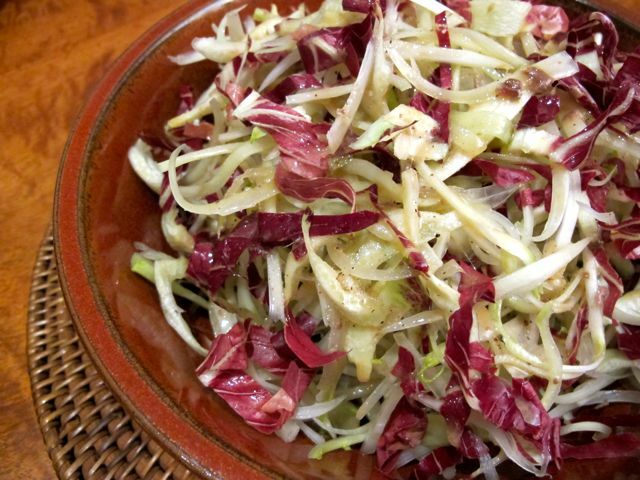 I wish puntarelle is available here too,to make your salad..i have to use endive or chicory..last nite,i cooked the salmon on the previous post..it was really good and easy,i use to prepare my salmon the same way you did ,without shrimp and potatoes.Thanks MM ! It’s like a cluster of stubby white asparagus growing from a single stump. Perhaps the individual stalks suggest themselves as phallic because they are fat, tubular and swell slightly around the middle just like Greek columns. a first for me to see these (puntarelles). i had to look closer to check out which the phallic symbol was. it would be fun to try out other ingredients to dress the salad.